There are many many kinds of jewelers tools that have been specially designed to make your work pleasurable and your end product a masterpiece. Not all the tools that you will want and need for making jewelry has to be sourced from specialist stores. You can try your local hardware store and be pleasantly surprised at the handy tools you can use. 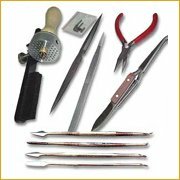 There are however many specialist stores that are providing good, reasonably priced jewellery-making tools that will aid you greatly. It can be quite bewildering as to what tools to use with what and when. so here, we try to give you an expansive list of jewellery tools and supplies, what they are and how to use them.